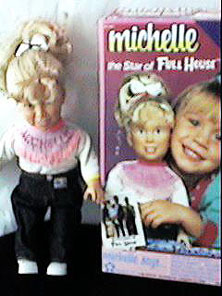 The Michelle Doll came out in 1990. 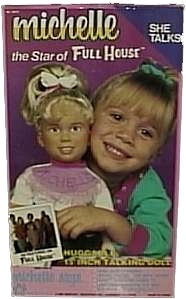 Mary-Kate and Ashley Olsen, (Known as 'Michelle' on Full House) have a doll made for thier character on Full House. Mary-Kate was the model for one side of the box, and Ashley on the other.They could not put just one of the twins, they both SHARED the role. As well as wearing different clothes, the twins were posed in different poses, instead of being posed and dressed to look like one picture copied on both sides. The doll stands 15" high and says 6 different sayings. A few sayings are- 'My name is Michelle'~'No Way, Jose! '~'You got it Dude! '~'Don't call me Squirt!'. All you have to do to make her talk is give her a hug! The Michelle doll was made by Meritus Industries Inc. It is battery operated. I think it is a cute doll and looks a little like Mary-Kate and Ashley. You can judge yourself by the pictures. You can use any info or pictures on this page you like, just please give Twins Online credit.